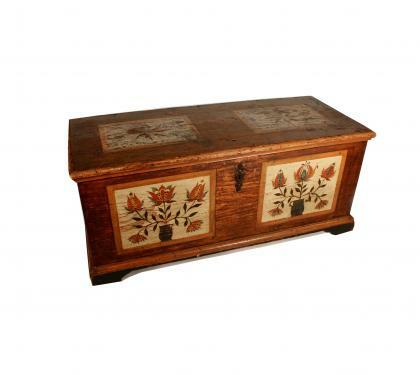 This rare painted pine blanket chest is reddish brown in color decorated with two panels on the lid with a compass star decoration. The spectacular front panels have a floral decoration with reverse colors, growing out of pots. One pot is signed "John Seltzer" and "1793" and the other pot has a flower with a face within. The chest is supported on straight bracket feet. Dimensions: Height 22" | Depth 22" | Length 51.5"